Discussion in 'Multihulls' started by Doug Lord, Dec 28, 2010. Happy New Year. It has been awhile. Good luck with the MPX. Better luck than the BSA had I hope. Hey, Hoyt-good to hear from you. Have a great new year! I've had lots of trouble but may get back to sailing later in the year. The good news is the big tri's using an almost identical foil system as Fire Arrow have proven how fast the system can be. I guess the engineering has got to catch up with the innovation-and I bet it will...... I've had excellent and informative conversations with the main designers of Gitana 17, Banque Pop and Macif which have been terrific. PS- I guess I'm a bit dense-what is "BSA"? * NOTE-see bottom of this page for max pressure comparison with an F18. 1-Singlehander- Excellent upwind and downwind performance with 220lb crew. Minimum crew weight 120lb. 2- Will foil in 5 knots of wind with 220lb crew . 3-Carbon rotating wing mast, carbon cross arms and carbon foils. 4-Retractable foils(from cockpit). Mainfoil retracts flush with bottom and tips are designed to not dig into sand. Rudder foil retracts above bottom. Ama foils retract above waterline when boat is level. 5-Extremely comfortable sliding seat on each side. Allows crew to move 1.75' outboard very quickly. 6-Uses the Fire Arrow Foil System(like Fire Arrow, Gitana 17, Banque Pop, Macif and Maserati)-- the same as the original system first used on the Test Model- except the larger boats use two rudder t-foils on each tack. WOLF has two UptiP ama foils-one used at a time-and one wand controlled mainfoil for very early takeoff and capable of substantial downforce- all working with a single rudder T-foil. Downforce can be virtually instantaneous adding RM in response to gusts. 7-Foiling throughout the wind range -including very light air-the essence of 3D SAILING! 8- Assy Spin/Screecher retracted under the front deck. 9- Boat folds from max beam to trailerable width in about 4 minutes. No waterstays. 10-Mid (wish)boom mainsheet so sheet is always in forward hand and extension tiller always in aft hand. 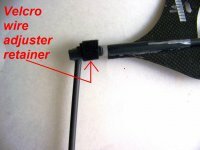 11-Quickly self-draining cockpit-large scuppers with backflow flap. 12- Planing ama hulls designed for incidental contact with water at speed and for inadvertent contact at slow speed. Adjustable angle of incidence of planing surface of each ama simultaneously. Angle of incidence of ama foil has to be changed when this is done. Planing surface starts at +4 degrees. Uses Two-Stage Amas-see attachments below. They consist of a planing ama hull(Stage One) coupled to a "curved piece"(Stage Two) that provides extra buoyancy in the event of a knockdown. Curved piece facilitates high dihedral crossarms which keep the crossarms clear of the water. 14- Aerodynamic surfaces added to forward and aft crossarms. Adjustable flaps added on rear cross each side. Jib foot and forward part of main foot to be sealed to deck. 15- Adjustable crossarm dihedral for prototype to facilitate testing.
" The main need is to lower the wind velocities required for flying in order to increase the opportunities for high speed travel"
" On these big boats, when you ease a sail, it is a pain because it takes so long to grind it back in. But here you press a button and the angles of incidence change. And with the foil on the daggerboard you can use it to alter the flight according to the wind*. If it builds, rather than easing the sheet you increase the righting moment by increasing the angle and conversely, as it eases you can reduce it and let it fly more." * done 100% automatically on Fire Arrow/ WOLF with wand controlled main foil. BSA was once Boy Scouts of America. It has changed a lot, even the name. I was referring back to a post about sea scouts from 2013. I vaguely remember something like that-in an Everglades thread wasn't it? I think it was in one of your threads. WOLF daughter of fire arrow----- Wolf makes it into the International Hydrofoil Society Newsletter, pgs 8-9. JOIN the International Hydrofoil Society FOR FREE!!! WOLF daughter of fire arrow-- it may be possible to design a t-foil that has similar characteristics to those of an uptip foil: that is-automatically maintain the flight altitude of the hull it's attached to with no moving parts and the foil would not function like a surface piercing foil,in other words, little to no dependence on speed for altitude control. The advantages would be at least two: 1) to move the center of lift of the foil substantially outboard when used in a trimaran ama application,and 2) simplicity. Possible problem/complication: increasing lift for low speed takeoff: Changing AOI for low windspeed takeoff may not be possible with a flap, so changing(shifting) rake angle for low windspeed takeoff may be the only solution. 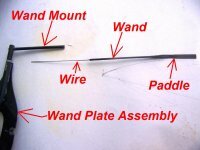 The system uses a small diameter stainless steel wire glued to the inside of the wand. 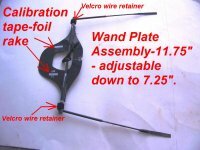 The wand/paddle/wire assembly slides thru the inside of the wand mount. 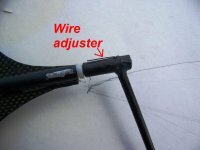 The wire is bent over and retained with velcro. 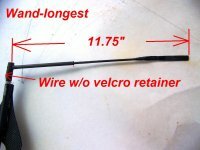 To shorten the wand, the velcro is removed and the wand shortened up to 2 inches and retained with the velcro-shorter than that would probably not be required but it can go 2.5 inches shorter but then the wand tip is above the bottom of the hull at flap neutral. The wand is coated with cyano to make a tight fit in the wand mount. The wand system controls the flight altitude of the main hull and the angle of heel(10 degrees) of the whole boat. Further, the wand controlled main foil working with the rudder t-foil controls the pitch of the whole boat and, simultaneously, the ride angle of the lee UptiP foil. The dual wands work like a single wand even with the boat heeled to 10 degrees +. One of the most critical functions of the wand system is to create downforce when the angle of heel exceeds 10 degrees. 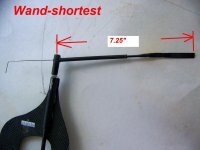 Downforce can substantially increase the righting moment of the boat and the wand system will allow the foil to respond to gusts almost instantaneously. The post quoted below was written before any of the ULTIM tri's were sailing. At the time, I was excited that Maserati(thanks to Guillaume Verdier) was using a foil system almost the same as the Fire Arrow Foil System. The major differences were that Maserati had three rudder t-foils vs one for the Fire Arrow and used "L" foils mounted at an angle so that they would work like UptiP foils vs the unique UptiP foils on Fire Arrow. But I was knocked out when I learned that not only Gitana 17 but Macif and Banque Populaire would be using the basic Fire Arrow Foil System with their versions designed by Verdier and VPLP--just so very,very cool!! And just recently(see previous page, post 2845) I found out from Vincent Prevost that the Macif test boat(see picture below), based on a 24'Diam, was converted to not only use UptiP foils but an adjustable foil on the daggerboard like the others! In one of the wildest things that has happened in a while a guy on another forum discovered that Maserati is the FIRST fullsize trimaran to use a lifting foil on the daggerboard in combination with an UptiP foil* on the stb ama!!!!! Very similar to the Fire Arrow configuration conceived of 6 years ago and tested successfully in light air two years ago! *Maserati's ama foil(s) are "L" foils mounted at an angle so they go thru the water like an UptiP foil. First** trimaran in the world to fly with effortless stability on the horizontal loading-bearing surface of her centerboard, Maserati Multi70 brilliantly puts into practice Guillaume Vernier and his Team’s idea of flying on three resting points using a load-bearing centerboard, L-foil and a rudder instead of the two rudders and single foil adopted on America’s Cup cats. Giovanni Soldini and his Team are engaged in a new challenge as they endeavour to turn Maserati Multi70 into the first ocean-going flying trimaran. An ambitious project that spans not just Guillaume Vernier’s excellent work (he worked on the modifications to her appendages) but also over 4.000 nautical miles of sailing clocked up by the Team this summer. The straight central daggerboard plays a revolutionary role in this new flying trim as the horizontal load bearing surface at its end generates lift, raising the boat out of the water. “When Maserati Multi70 rises up on her lateral foil and rudder, the daggerboard wing acts as a third resting point – the central and largest one”. Tests in wind of 40 knots have demonstrated that Maserati Multi70 is now much more stabilized and able to fly in conditions unthinkable before. Safely tackling also big seas. ** Fire Arrow was the first trimaran to use this configuration! A while back I was thinking of a 15' version of the Fire Arrow and was troubled once again by calling such a crucial piece in the ama function and design a "curved piece". Then a light flashed on and I came up with a technically correct name for the ama + the "curved piece" : a "two-stage ama". The reason "two stage ama" works is because the curved piece actually is part of the ama though quite distinct from the ama hull. And in sailing, the buoyancy of the ama hull and of the curved piece affects the RM of the boat in two distinct stages: Stage 1- when the ama hull is immersed the RM is enhanced by the 6lb(about 280lb full size) of buoyancy of the " ama hull", Stage 2- when the "curved piece" is immersed the RM due to the immersion of the ama hull is doubled". So from now on this feature of the Fire Arrow will be called a Two Stage Ama. Interestingly, in the testing done so far even in the overpowered conditions of the second video the second stage of the ama(the curved piece) has not been submerged. This hasn't been tested yet but ,theoretically, the high dihedral crossarms coupled with the Two Stage Ama should allow self-righting from at least 90 degrees(if it ever gets that far). But,again, whats really cool about the Fire Arrow concept is that sailing(foiling)- the main and rudder foil working together control the ride angle of the planing surface and the foil! In other words neither can pitch up or down on their own. 1-Statically- the boat is sitting still and hit by a hand of God gust. It is theoretically possible that the boat could be knocked over with the mast horizontal but the two stage ama offers reserve buoyancy after the the ama hull itself is immersed and yet it is not enough to fly the main hull. It is enough, however, to right the boat. b. Second, and a sort of back up at speed, is the planing hull design of the ama. To start with on the Fire Arrow, the planing surface, only comes into contact with the surface at very low speed with the ama starting to fly before the main hull does. And when the boat is flying the ama performs the same function that the planing ama on Hydroptere does: reserve lift during incidental surface contact at speed. why has high buoyancy become so important? High Power Very Small Tri(s)-10'-14'-why not?